Mantis shrimps or stomatopods are marine crustaceans, like crabs, rock lobsters and other shrimps, however they are not a 'shrimp'. Mantis shrimps are highly aggressive crustaceans that capture prey using large, raptorial claws much like that of a praying mantis. Also called "shako", "sea locusts" by ancient Assyrians, "prawn killers" in Australia. They are very attractive and beautifully coloured in shades of red, green and blue. There are two main types of mantis shrimp: 'spearers' and 'smashers'. Both types strike by rapidly unfolding and swinging the raptorial claw at the prey. 'Spearers' have a claw lined with numerous sharp teeth and they hunt by impaling prey on these teeth. They usually feed on soft-bodied animals like worms, shrimps and fish. 'Smashers' have a claw shaped like a club, which they use to smash and hammer their prey. They usually feed on hard-bodied animals like snails and crabs. Mantis shrimps play an important role in marine ecosystems, regulating the numbers of other species and promoting higher overall species richness. 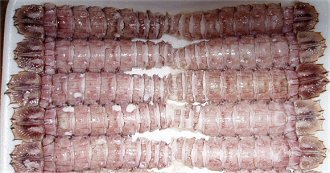 Also, where the seabed is soft, the burrowing behaviour of mantis shrimps contributes to the turnover and oxygenation of sediments. Mantis shrimps are also sensitive to environmental pollutants and are good bio-indicators of pollution on coral reefs. Did You Know? Mantis Shrimp are the only animals to have hyperspectral colour vision and are considered to have the most complex eyes in the animal kingdom. They can see ultraviolet, visible and infra-red light and different planes of polarized light. The shape of their eyes allows them to see things with three different parts of the eye at once. Mantis Shrimp live in a vertical hole in the mud with only the eyes showing. They snap at small fish in its "preying Mantis-like" arms and drags them into the hole. Many different species of mantis shrimps live in Australian waters. Most of them are less that 15 centimetres long, but some species reach more than 30 centimetres and would appear quite fearsome to a fish! While many are pale blue, green or brown in colour, several tropical species have beautiful colours and patterns, like the one in the movie. Mantis shrimps have eight pairs of legs (the first five pairs are equipped with claws) plus modified legs known as pleopods on their abdomen which are used for swimming. The eyes and the first pair of antennae are attached to separate movable segments on the head. They are aggressive predators and feed mainly on small fish, other crustaceans and molluscs. They use their large second pair of legs to catch their prey. 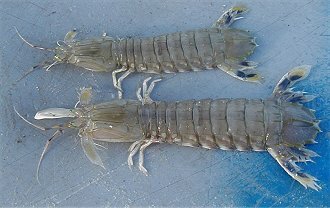 Depending on the species of mantis shrimp, this pair of legs is either equipped with spined claws that are used like spears or hammer-like claws that are used to batter their target. They strike their prey with acceleration of up to 23 metres per second. The shock wave from the force can be enough to stun or even kill the prey. Some larger species with hammer-like claws have even been known to break the glass of aquariums. Females carry the eggs or lay them in their burrow. After hatching, the larva initially lives on the seafloor but the first or second moult it commences a planktonic stage. During this time it looks very different to the adult. After a few months drifting at sea it again moults to metamorphose into a burrow-dwelling adult. About 400 species of mantis shrimp are known worldwide. Close to 250 species occur in the Indo-West Pacific region and more than half of these occur around Australia. New species are regularly being discovered, even off the coast of New South Wales. Mantis shrimps support large fisheries in many parts of the world but they are susceptible to overfishing and habitat loss. Most species of mantis shrimp live alone, but there are some species that live in pairs for life. Mantis shrimps can live in burrows and crevices on coral reefs, or on the seabed down to a depth of 1500 metres. The eyes of the mantis shrimp are among the most advanced in the animal kingdom. Human eyes each create a single picture and the two together means that we have binocular vision. Each one of the Mantis Shrimp eyeballs creates 3 separate images, a trinocular eyeball, that means the two eyeballs together have sextocular vision. Human eyes can detect 3 color wavelengths, the mantis shrimp can detect 12, nine more than we can. They can see colors that we cannot even see or imagine. Mantis shrimps are divided into 2 categories, First The Spearers - they have spiny barbed front scooping claws designed to stab and snag prey. The other is The Smasher - they have "bowling ball" hands that they use to smash their pray. They have the fastest punch in the world with the same acceleration as a 22 caliber bullet. The mantis shrimp can deliver a blow with 1500 Newtons of force. Water moves out of the way so fast that little vacuums are formed called cavitations bubbles. These bubbles collapse immediately and the force of that collapse creates a second shockwave and it even generates light and heat. 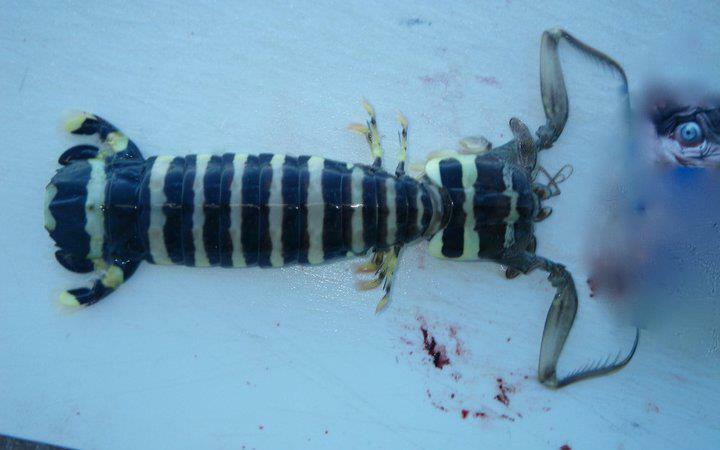 Mantis shrimp can be eaten raw as sashimi or a sushi topping. 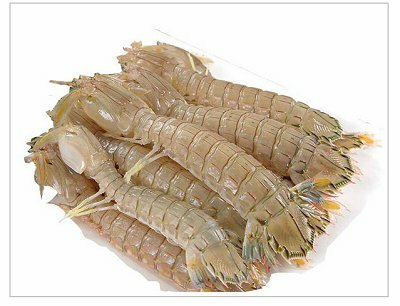 Cooked Mantis Shrimp is similar to lobsters in taste and texture. See Recipes for Crustaceans - any lobster, shrimp, crayfish, bugs & crab recipe is suitable for Mantis Shrimp. How long to cook mantis shrimp? For 1 kg green (raw) shrimp. Bring 2 1⁄2 litres of water to the boil, add 2 tablespoons of sea salt. Add shrimp to boiling water. Cook for 3-4 minutes. Shrimp are done when they float to the top of the water. To test, take out a shrimp and hold it to the light, it is cooked when the flesh has shrunk from the shell slightly and the prawn looks translucent. When they’re done, remove them from the boiling water and place in a big bowl of iced water to cool them.